Ever since the late 18th century when Frans Anton Mesmer brought the use of hypnosis (mesmerism) as a therapeutic tool to the attention of the public, therapists have been using it as a powerful tool to help them with suggestion therapy. If we look back into ancient history, we will find that the trance like state that we call Hypnosis has been used for thousands of years. In fact, from the study of primitive peoples’ religious and healing ceremonies there exists the elements essential to place people into a hypnotic state. By rhythmic chanting, monotonous drum beats, together with strained fixations of the eyes, the village shaman or priest is able to induce catalepsy of the body. This helps to give the shaman the appearance of having magical and mystical powers given to them by the gods. Today we call it suggestion therapy. The use of suggestion therapy goes back much further than Mesmer. If Mesmer were to be called the Father of Hypnosis, then the great, great —- grandfather of Hypnosis could arguably be the ancient Egyptian priest, Imhotep. (I-em-hotep, he comes in peace) Hypnosis, suggestion therapy can be traced back over 4000 years to ancient Egypt. The Egyptians used healing sanctuaries to heal people with all sorts of problems, both physical and mental, most of which today would be classed as psychological problems. These healing sanctuaries were called “Sleep or Dream Temples.” In these temples, the sick person was put in to a trance like sleep; priests and priestesses then interpreted the person’s dreams to gain knowledge about the illnesses and to find a cure for the illnesses. 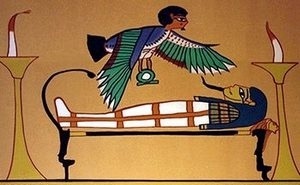 The tradition of temple sleep dates from the time of Imhotep. The ancient Egyptians worshiped the priest Imhotep and dedicated Sleep Temples to him; he is the earliest known physician. He was the physician vizier, architect and priest, to the pharaoh Zoser (2650 – 2590 B.C.). Imhotep built the step pyramid, which is the first pyramid. In recent times Imhotep has become a Hollywood star; the name of Imhotep was used for the priest who became the Mummy in the latest film “The Mummy”. Temple sleep was used as a psychotherapeutic tool; the temples of Imhotep were well attended by people looking for psychological help. 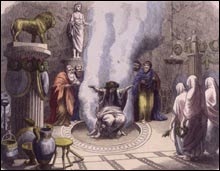 Under the influence of incantation and the performance of religious rituals, sick people were prepared psychologically for suggestion therapy; they were put in to a “hypnotic state.” Before falling asleep they were influenced by suggestions, in the hope of provoking dreams sent by the gods. Today in some parts of the Middle East and Africa you can still encounter shrine sleep. Sleep Temples were and are used for the mentally ill, as a place where priests interpret the sick person’s dreams. Thus, by the use of suggestion, (and the help of the god) the priests appear to cast out bad spirits from the mind and body of the sick. In Greece, Sleep Temples were renowned as places of great healing and were dedicated to the healing god Æsclepius. Æsculapius took over the role of Imhotep. Sleep therapy survived in the temples of Æsculapius, which were constructed by the Greeks in the 5th and 4th centuries BC. Æsclepius (also spelt: Asclepios, Æsclepius, Æsculapius, Æsclepius) was a healer, his mythical roots going back in to the second millennium BC, he became a demi-god. Over time he evolved into a temple god in his own right. The temples in his honour were temples of healing dreams. His daughters were Hygea and Panacea. A Klínè was a sacred place or a sacred skin set out around the temple, where the sick person reclined to enter the dream state. From these names we have derived the words, Panacea, Hygiene and Clinic. At the height of the cults power, there were 420 temples, spread across the ancient Greek empire. Healing would take place whilst the person being cured was in a deep trance like sleep. The god Æsculapius could perform miraculous cures in the dreams. This sleep would come about by the power of the priests, who used chanting and magical spells to put the patient into a trance. This trance state was known as incubation; incubation is derived from the Latin, In (on) cubare (to lie down). A person could be kept in this state for up to three days, during which time the priests using suggestions would help the person, through their dreams, to make contact with the god, thus helping them to obtain a cure for their illness. The temples were a place of spirits, and mysterious powers, a place to find mental and physical healing. The people looking for a cure or an insight to their problems were called Seekers. A Seeker had something on their mind, an ailment, an issue, and an inner quest to discover themselves. They came to seek an insight into their problems, to contact the healing god, to get a new vision that would heal, guide, or provide comfort. The path to the Temple was lined with huge the steles made of marble, on which were carved inscriptions, describing all the miracle cures, and the miraculous healing that had taken place in the Temple. It was claimed that people were cured of incurable diseases; the lame were able to walk again, people who were blind could see again. They were cured by the sole supernatural healing power of the divine dream. This was a power that the priests knew from ancient times. The priests, who used secret rituals, incantations and traditions for therapeutic purposes, preserved this power; they were part priest, part physician, and part shaman. They were skilled in the interpretation of dreams; they were also skilled in the use of medicinal herbs. There were also attendants/caretakers of the temples, who had their own sacrifices and ritual activities to perform. They would council new seekers, also see to it that they were cleansed and purified. They were skilled practitioners and offered advice on how to seek interpretations of dreams. The Seeker did not just go in to the temple; they had to wait for the right time to come. Before being allowed to enter the temple, and before the healing dreams could occur, they first had to learn the rituals and perform the rites of purification; they had to cleanse the body, mind and soul. They would meditate, fast, take hot baths, and make a sacrifice to the god. They looked for signs in their dreams. When the signs and omens looked right and they had cleansed the body, mind and soul, only then were they allowed to enter the main part of the temple. The main part of the temple had a large open floor area, with sacred alcoves to the sides, where the seekers could unroll their sacred skin, their Klínè; they would then sleep and dream of god Æsclepius healing them. A good dream would be one in which the god would cure the wound by touching it. Once the person woke from their sleep, the attendant would spend time with them, reviewing any visitations from god, helping to explore the dream and secure the insights appropriate to that seeker at their stage of development. The dreams of the seeker contained the seeds of their own healing. The attendant’s job was simply to elicit the vision of the god and aid the seeker in making sense of their personal dream story. Through incubation, the seeker was to awaken to his real self and in so doing regenerate himself physically, mentally and spiritually. Today we recognise a lot of what went on in the Temples as suggestion therapy. Over time the priests developed a greater understanding of herbs and their use. They started to move away from the sole use of dream interpretation and suggestion therapy, using their growing knowledge of herbs; they started to develop unguents, tinctures and medicines. Whilst dreams in their early forms involved a direct visit from the god, over time the dreams became more metaphoric, the dream became symbolic of the person’s problems. The attendants became dream interpreters, from these interpretations the priests would make up prescriptions for medicines. Over the past 4000 years, the Sleep Temple, the Priest and Dream Sleep, have slowly evolved in to what has become modern Doctors, hospitals and medicine. The ancient Hebrews used meditation with chanting, breathing exercises and fixation on the Hebrew letters of the alphabet that spelled their name for God, to induce an ecstasy state called Kavanah. (These ritualistic practices are very similar to Auto-hypnosis). In the Talmud, Kavanah implies relaxation, concentration, correct attention (motivation). People such as fire-walkers, and priests who used the religious practices of laying on of hands to make people faint on to the floor, are using Auto-hypnosis to bring about an altered state of consciousness by the use of suggestion and expectation. The Romans also adopted the use of healing sleep/Incubation Temples throughout their Empire. The Romans dedicated their Sleep Temples to the god Apollo – Æsclepius. Sleep Temples even got as far as Britain. Even now in the UK, you can visit a Roman archaeological site at Lydney Park, Lydney, Gloucestershire, where you can see the remains of a Sleep Temple. Sir Mortimer Wheeler excavated the Lydney Temple complex in 1928. One of Sir Mortimer’s assistants was the young Professor J.R.R.Tolkein, who went on to write “Lord of the Rings”; it has been suggested that he based Middle Earth on the landscape surrounding the Temple. Article published with authors permission ©David Reeves. David Reeves, works as a Hypnoanalyst and Stress Management consultant in Swindon and Harley Street London, and the USA. He has trained in Battle Field Stress Disorders, and is a member of the International Stress Management Association (UK), The International Association of Hypnoanalysts (UK), The National Register of Advanced Hypnotherapists (UK), The International Society for Professional Hypnosis (USA, Incorporated under the laws of State of New York), The National Guild of Hypnotists, (USA) The European Therapy Studies Institute, and The Hypnothink Foundation.